I have been waiting for sunshine for a few days and we finally got sun today. We’ve been having wild and crazy storms lately and it has been dreary day after dreary day. A girl can only stay inside for so long. I pretty much don’t want to go inside today because I know we are supposed to get more rain this week. So I’m soaking up all the sun. Give me all of the vitamin D you’ve got, Sunshine. I’m taking it all. 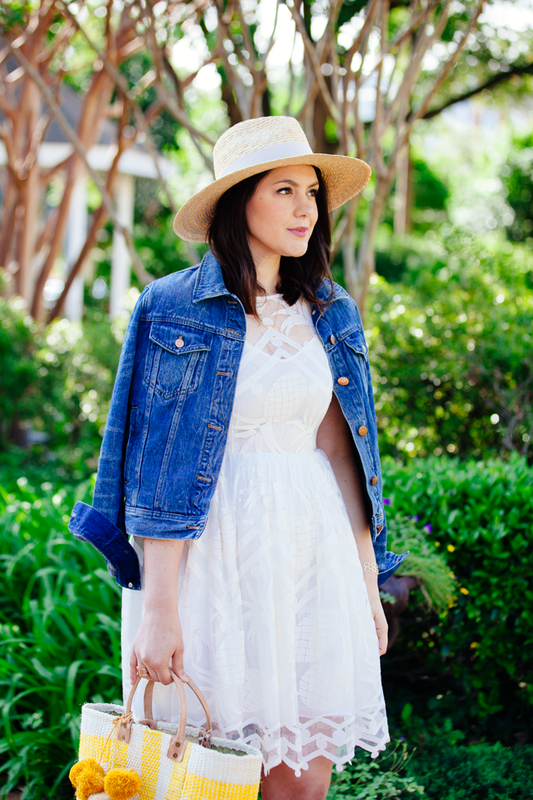 Should I stop buying white dresses? Yes. Will I? I don’t know but… probably not. And while I shall not wear this dress to a wedding, I might wear it on a vacation. A vacation that has yet to be booked. I mean for heaven’s sake, this dress has pineapples on it and if that doesn’t scream ‘take me on vacation, husband‘ then I don’t know what does. Perhaps a super subtle blog post that I will force my husband to read. Yes, that has to work. And if that doesn’t work we are going full on pineapple hat. Subtle is my specialty. PS: my dress is now 50% off! best news ever. besides vacation news. I love that dress! I already have two white dresses, but I think you’ve talked me into a third. And it’s nice to know I’m not the only wife who uses her blog to give hubby a good hint haha. Whatever works 😉 I hope you get a nice vacation out of it! This is such a fun pineapple dress! Super cute that the pineapples are white instead of yellow and green. 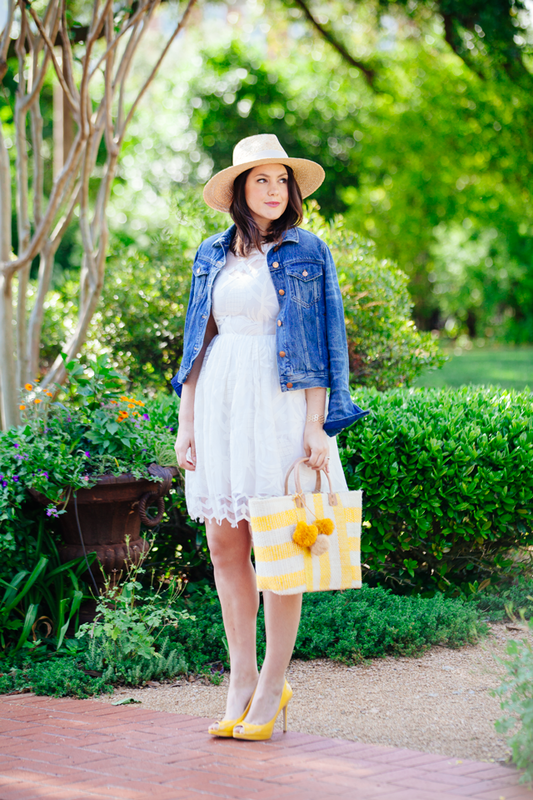 Your Mar y Sol tote goes perfectly with this look! I’m loving this dress! 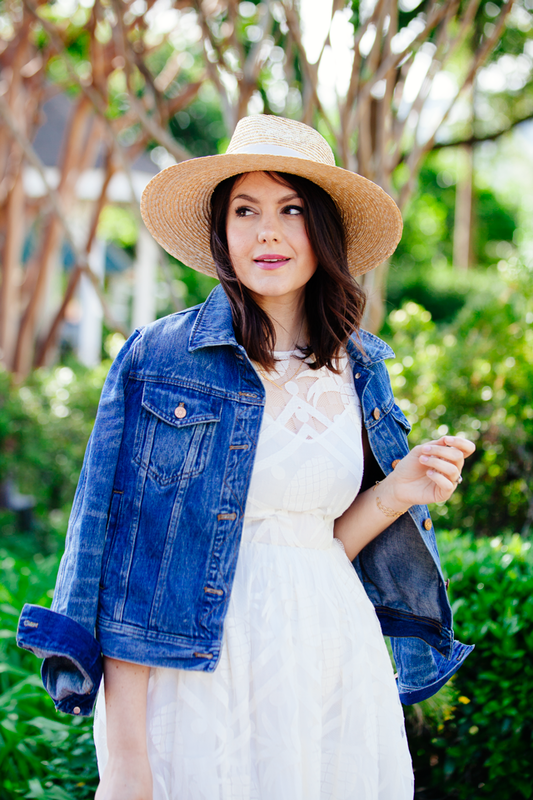 I love how you paired it with the denim jacket! You look so beautiful in this girly outfit! I like your style very much. The bag is super cute! Love it! I kinda hope your hubby doesn’t get the hint ’cause I REALLY want to see the pineapple hat. Lovely dress!! Lovely look! Love the yellow accents! Such a pretty dress, love the color and details! You look beautiful. That white dress is stellar! 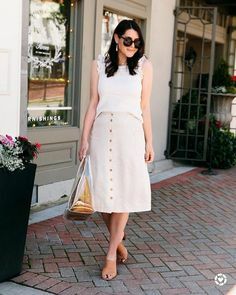 This is such a cute summer outfit! I love anything pineapple printed, but the subtle detailing on this dress is refreshing. gorgeous dress! love the yellow accents! I'm loving this dress! I love how you paired it with the denim jacket! Dear Kendi, my budget kindly requests that you look dowdy and frumpy for the next few months so it has the chance to recover. 😉 I love this dress so much, I ran right out and bought it. You look gorgeous! I am obsessed with the pineapple print this season. Great look. I kinda hope your hubby doesn't get the hint 'cause I REALLY want to see the pineapple hat. Lovely dress!! Aaaaah, love the dress, it’s so gorgeous! And with the yellow! Very summery. 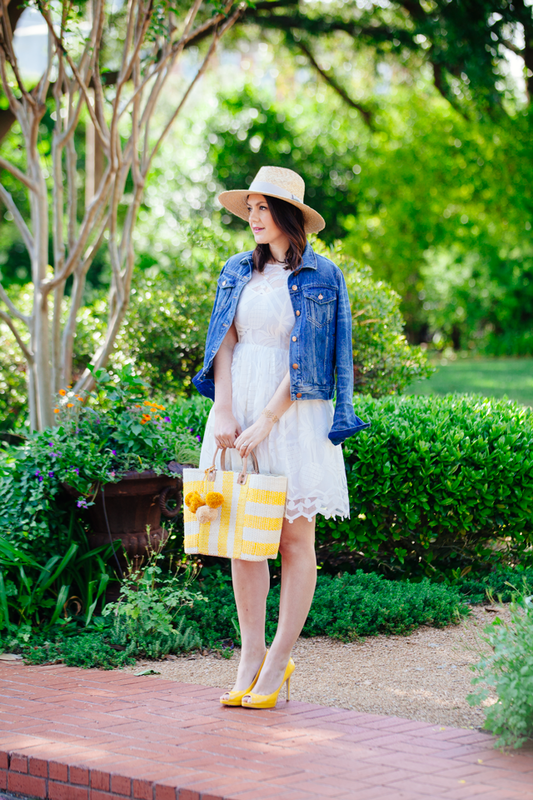 Love the cute pom pom embellishments on the pretty striped tote and the dress is so lovely! 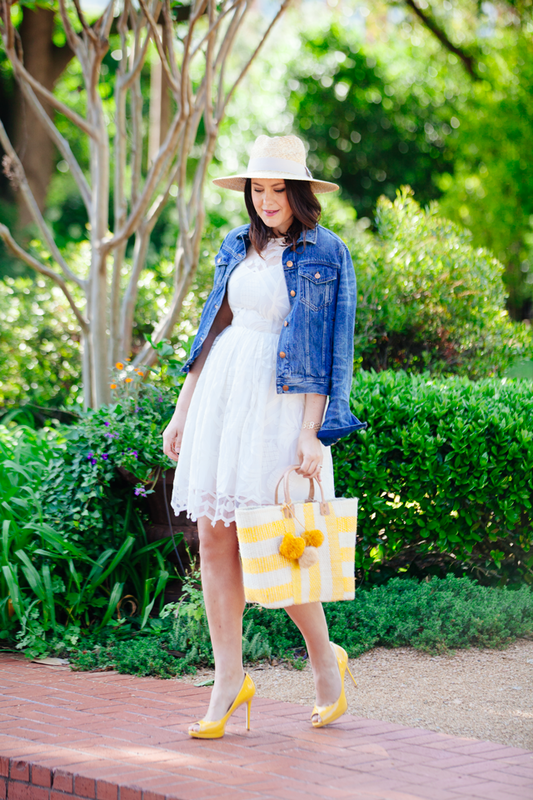 A perfect girly look for Spring and Summer! Kendi! You are my hero! I have been eyeing this dress for a while, hoping to wear it to my rehearsal dinner. Without you, I would have never known it went to 50% off, and I might have missed my chance. BUT I went to Anthro straight after work & they had my size! Aaaaah, love the dress, it's so gorgeous! And with the yellow! Very summery. For some reason I feel like all white dresses have such a lovely silhouette! Great outfit Kendi! Such a pretty look!! Love the yellow accents!! That tote is so adorable! I would seriously use it all summer! I was crushing so hard on this dress, but like you wrote about- little white dresses are hard when you need dresses to wear to weddings! 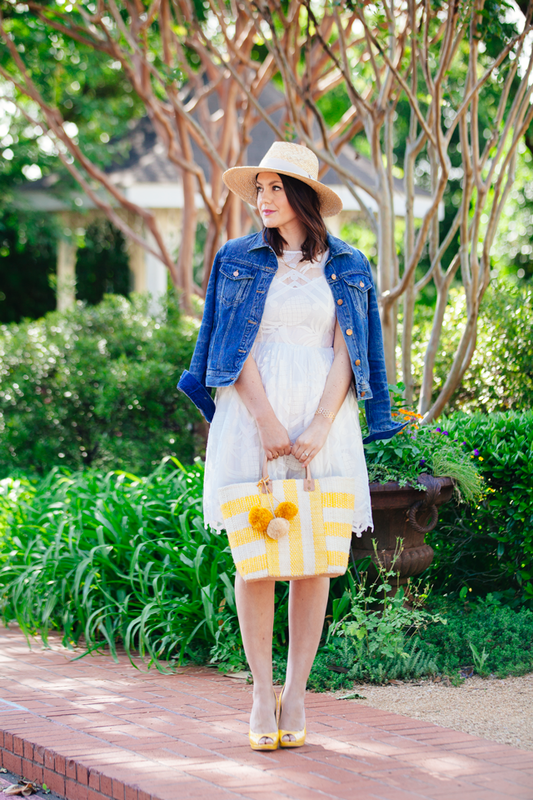 loving your pineapple dress! adorable accessories! Oooh I need this dress in my life!!! What an adorable outfit! And, I must have that tote! Great outfit. Another gorgeous look!! Love that dress! Your outfit is amazing. I love it. That dress is stunning, I’d love a dress like that. Those heels are a great touch. Your outfit is amazing. I love it. That dress is stunning, I'd love a dress like that. Those heels are a great touch. 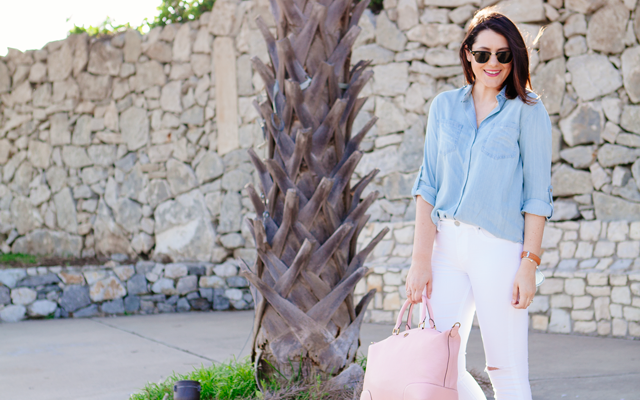 Just found your blog while browsing, love your name and LOVE this outfit! Now I need to find some yellow shoes!